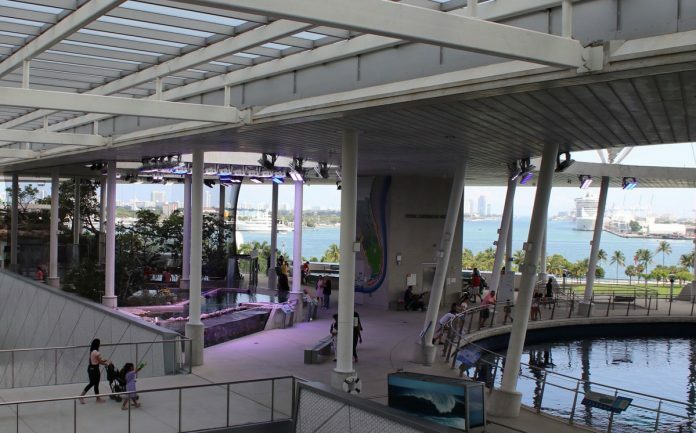 The express intercity higher-speed Brightline service is really remarkable and a suggested ride for a day trip to Miami where, a visit to the Phillip and Patricia Frost Museum of Science to enjoy weather and technology exhibits, planetarium, and wildlife centers, is a must do. 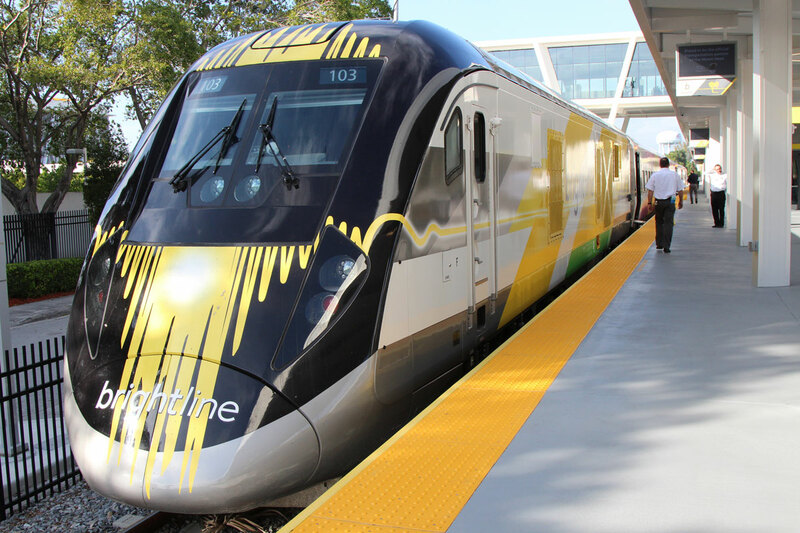 The cultural riches of Miami are now within reach with the deluxe speedy Brightline train. 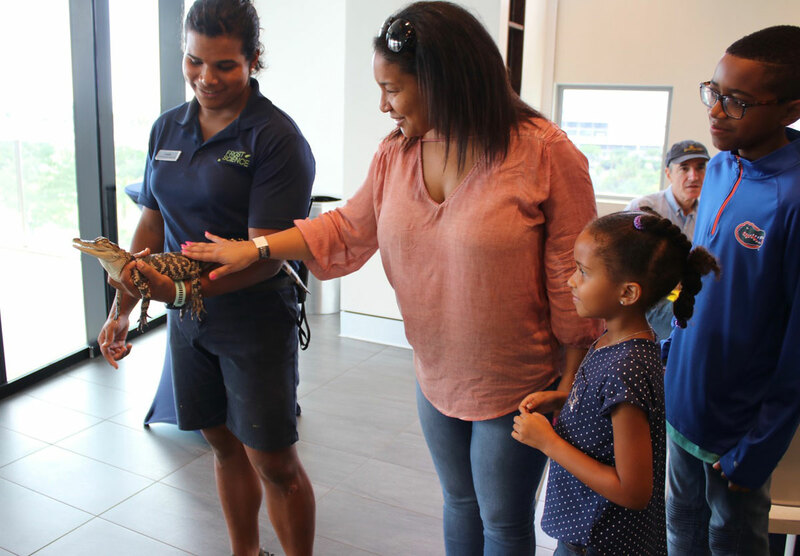 Using the connection Brightline offers to experience first class train services and an insider tour of the Phillip and Patricia Frost Museum of Science, is an invite too good to pass up. Parking is easy at the train station, ticketing even easier and the high-ceilinged lemony fresh yellow and white station lounge makes it even nicer. Security is everywhere to guarantee a safe experience for everyone. The Brightline stations feature a better lounge than you find at most airports, with a Select class area fully stocked accordingly to the time of day; large screen TVs, and comfy leather couches with free WiFi. Brightline is really remarkable with three levels of service from the budget Smart to SmartPlus (a snack and drink provided on board) to the top level Select which includes the deluxe lounge then hot towels, magazines, free drinks and food service once on board. 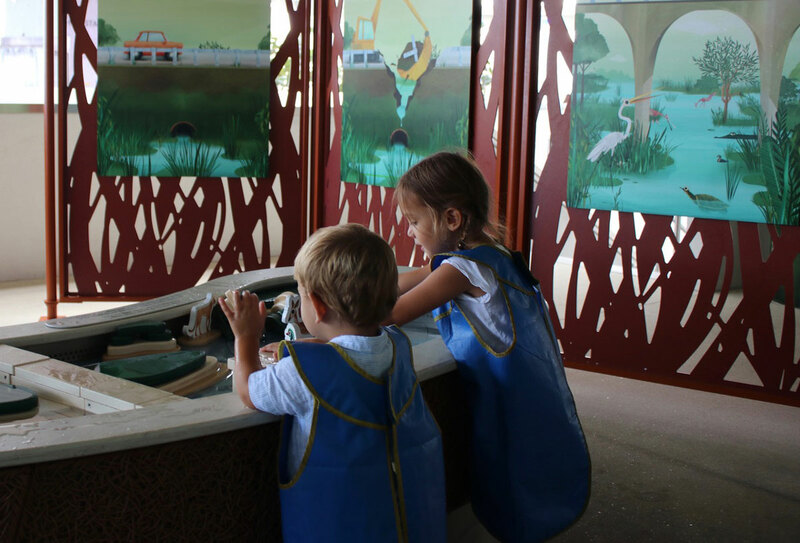 These innovative stations and trains are the centerpiece of a transportation service that presents a bright and optimistic view of the future for the millions of residents and tourists who crisscross the state’s highways. As a bonus, Brightline cruises through the Wynwood Art District allowing a rarely seen view of the murals and sculptural art installed on the buildings that face the railroad track backside – and there’s lots of it for several blocks on the west side of the train. The train running from downtown West Palm to downtown Miami is about an hour with a stop in Fort Lauderdale. From the Miami station, which has cafes, shops and even hotels and condos being built in this new mini-city, me and my pro photographer and artist friend Virginia took the free connected Metro Mover to the Phillip and Patricia Frost Museum of Science. This was my second visit there, but with all new shows it felt like the first time. We rushed into the Planetarium for the Asteroid: Mission Extreme film, narrated by Alien star Sigourney Weaver. Reclining seats give you a full-spectrum eyeful of this huge orbital screen with surround sound, whizzing planets and exploding asteroids played like a real-life action movie, as Weaver took us on a journey through rogue rock fragments that may hold the key to life in space. Astronauts crawl on the rocks as the Earth and Sun wheel in the sky around them. It’s hypnotizing and far out. After the heady experience of the space show, we had an animal encounter with a baby alligator who arrived cradled in the arm of a staff member. The well-behaved critter sat and slowly blinked as people stroked his scaly back and admired his sharp little teeth and claws. There’s an exhibit of the baby crocs on the roof deck next to the giant aquarium; once they get too large they are transferred to a zoo. 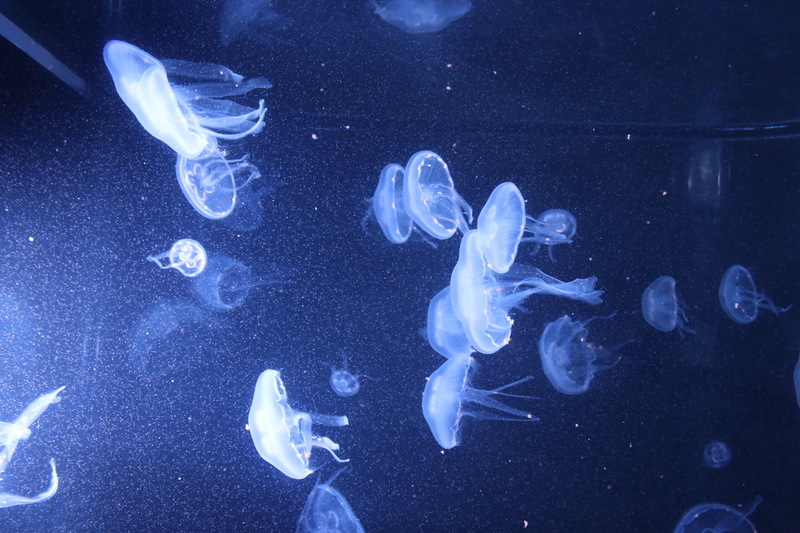 I really enjoyed the dark creepy cool of Creatures of Light: Nature’s Bioluminescence that dives into the world of critters that glow, and there are lots of them both on land and in the ocean’s depths. Fireflies (actually a type of beetle) are blown up to the size of a cow to show how they get their glow on. 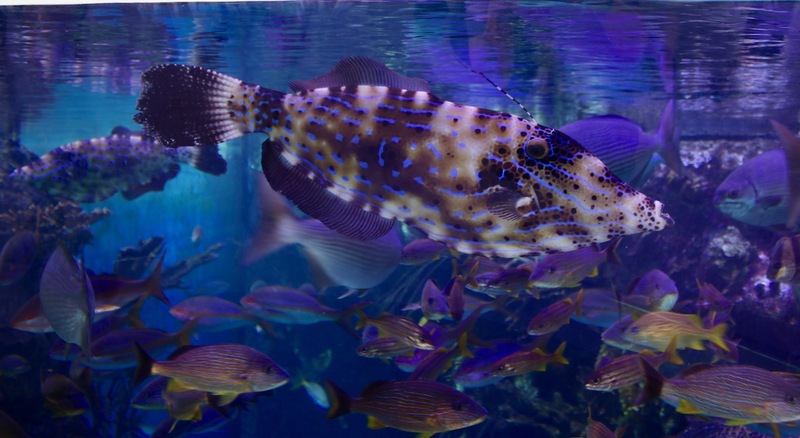 Down in the deep blue sea fishes glow through chemical reactions to scare off predators or signal other fish. 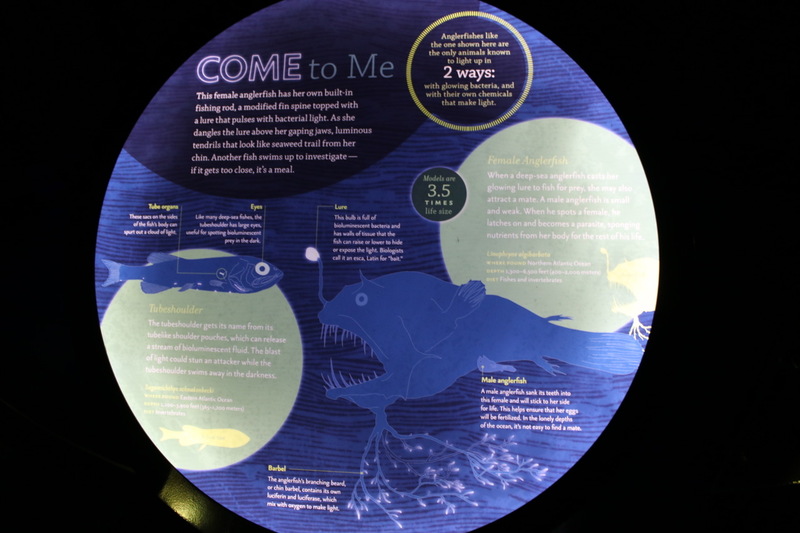 Lit up bugs create brilliant clouds in caves and in the skies, examples are illustrated through films, interactive displays and some actual fish that blink behind their gills. After the Planetarium, the most stunning object here is the aquarium and the oculus at the bottom of the aquarium. 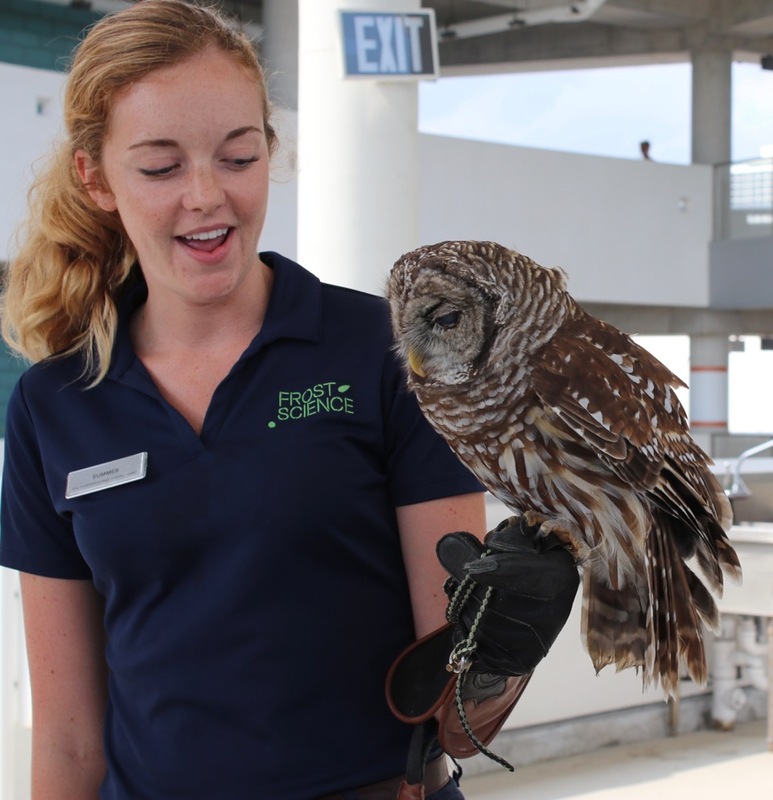 On the top deck there are displays of the Royal Caribbean Vista level to see the vibrant surface of habitats such as the Gulf Stream, Mangrove Forests with birds and animals crawling about and the Everglades where the gators and turtles live. 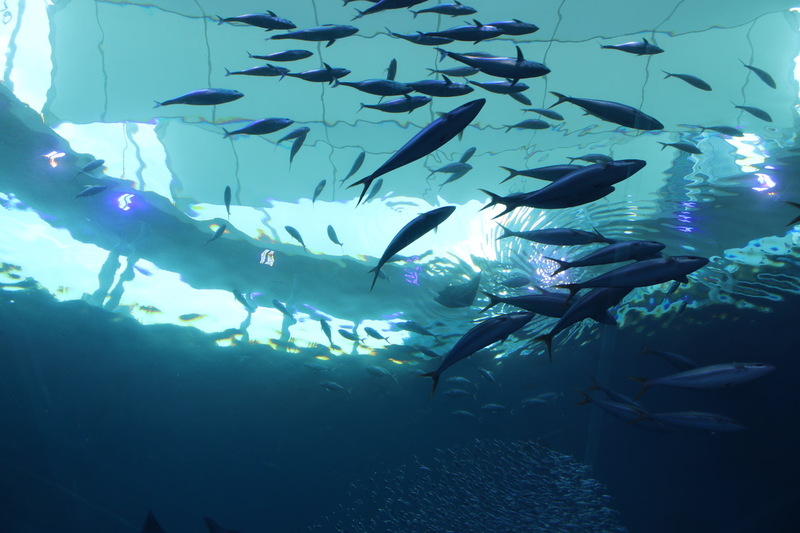 Descend to the lower Dive and Deep level to see the sharks and manta rays from underneath as they swim in a continuous current. We were treated to a feeding session as cut-up squid and fish and shrimp where chummed out into the water. 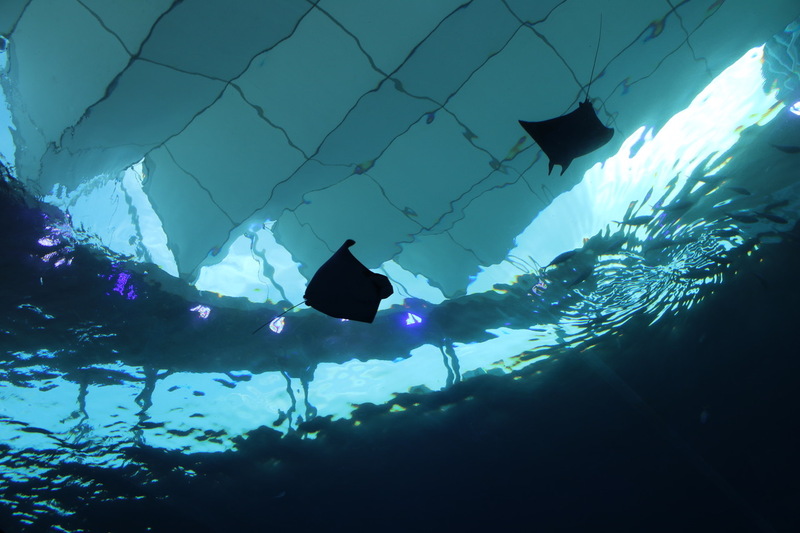 Each species flocked to eat their particular choice on the menu – the rays like the shrimp, the sharks like the fish and squid. The feeding brings on a frenzy as they thrash and jump about in the water to eat. Don’t fall in. As we watched the fishy buffet show, a gorgeous barn owl in rehab was brought out. The Museum rehabs and releases hundreds of birds a year. This owl had an eye infection but was otherwise calm and cool as he wisely surveyed his audience. They showed us his hidden ears folded deep in the feathers behind his eyes and explained how hunting is done with a combination of sight and sound. His head swiveled all the way around to the back to warily eye the shark tank action. Owls are cool. 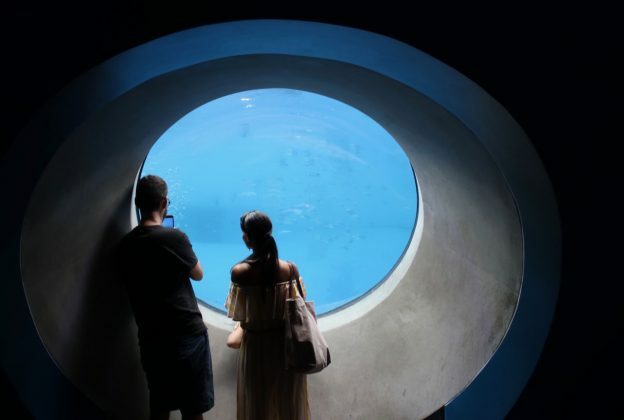 At the bottom level of the Phillip and Patricia Frost Museum of Science there’s the most wonderful object—the 31-foot custom-made in Europe oculus lens forming the bottom of the Gulf Stream Aquarium, where rays and sharks cruise overhead. 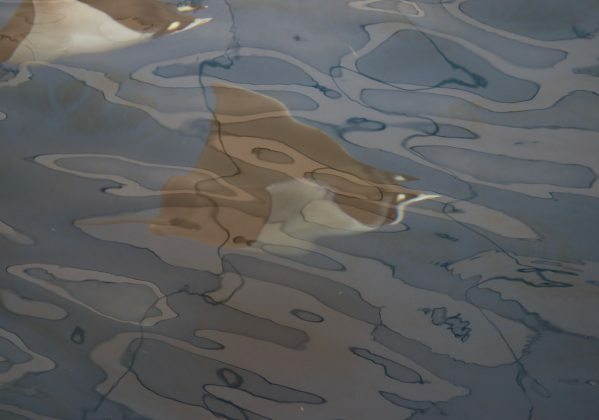 It glows from the sunlight until shadows of passing Hammerheads blot it out. The cool blue light it casts is mesmerizing and most of the people there are awed into silence under this mysterious thing. After a full day of lightning bugs, hooting owls, and menacing sharks, we hopped on the Metro Mover to catch the Brightline back to West Palm Beach. A new colorful patchwork of mural art from Miami artist Typoe graces the Select Lounge walls in the Miami station and a generous buffet of cheese, fruits, cold cuts and wine also await. With construction, limited expensive parking and highway hassles, this is a huge step in making the trip to Miami for the museums and upcoming art fairs. An easy and fun ride! Check Brightline’s website (gobrightline.com) to find updated information on connections, group passes and special travel deals.